Ratings definition (According to standard ISO8528 1:2005) PRP - Prime Power: It is defined as being the maximum power which a generating set is capable of delivering continuously whilst supplying a variable electrical load when operated for an unlimited number of hours per year under the agreed operating conditions with the maintenance intervals and procedures being carried out as prescribed by the manufacturer. The permissible average power output over 24 h of operation shall not exceed 70 % of the prime power. LTP - Limited-Time running Power: It is defined as the maximum power available, under the agreed operating conditions, for which the generating set is capable of delivering for up to 500 h of operation per year (whose no more than 300 for continuative use) with the maintenance intervals and procedures being carried out as prescribed by the manufacturers. No overload capability is available. • Soundproof canopy made up of modular panels, realized with zinced steel as treatment against corrosion and aggressive conditions, properly fixed and sealed allowing a full weatherproof enclosure. 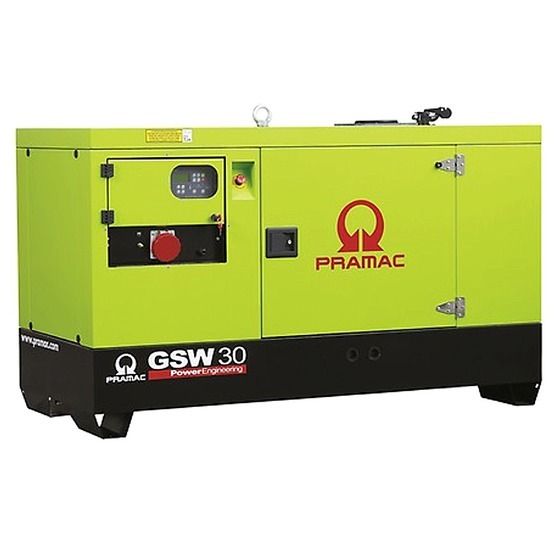 • Easy access to the genset for maintenance purposes thanks to: Wide lateral access doors fixed by stainless steel hinges and provided with plastic lockable handles and internal perforated galvanized steel-sheet; Detachable panels, with screws holes protected by rubber tap. • Lateral air inlet opening properly protected and soundproofed. Exhaust air outlet from the roof, trough wet section protected by proper grid. Full options list available on this generator, please contact us to discuss your exact requirements. Mechanical structure Robust mechanical structure which permits easy access to the connections and components during routine maintenance check-ups. Voltage regulator Voltage regulation with DSR. The digital DSR controls the range of voltage, avoiding any possible trouble that can be made by unskilled personnel. The voltage accuracy is ±1% in static condition with any power factor and with speed variation between 5% and +30% with reference to the rated speed. Windings / Excitation system Generator stator is wound to 2/3 pitch. This eliminates triplen (3rd, 9th, 15th …) harmonics on the voltage waveform and is found to be the optimum design for troublefree supply of non-linear loads. The 2/3 pitch design avoids excessive neutral currents sometimes seen with higher winding pitches. MAUX (Standard): The MAUX MeccAlte Auxiliary Winding is a separate winding within the main stators that feeds the regulator. This winding enables to take an overload of 300% forced current (short circuit maintenance) for 20 seconds. This is ideal for motor starting requirements. Insulation / Impregnation Insulation is of class H standard. Impregnation is made with premium tropicalised epoxy resins by dipping and dripping. High voltage parts are impregnated by vacuum, so the insulation level is always very good. In the high-power models, the stator windings undergo a second insulation process. Grey protection is applied on the main and exciter stator to give enhanced protection. Reference standards Alternator manufactured according to , and complies with , the most common specification such as CEI 2-3, IEC 34-1, EN 60034-1, VDE 0530, BS 4999-5000, CAN/ CSA-C22.2 No14-95-No100-95.